"This book gives a fresh insight into the life and times on our much loved islands. It would be a wonderful gift or anniversary present." Click here for the full review by Dr. Ian D MacLeod. "In January one of this year's highlights first came to my attention. It was Barack Obama's 'Dreams from My Father'. Further non-fiction which is worth the purchase price is the beautifully-illustrated 'William Daniell's Isle of Skye and Raasay: An Artist's Journey in 1815'. What a little gem, to enjoy not only the text and travel details but also the lovely reproductions of so many well-known prints." Contribution to 'Best Books of 2009' by The Librarian, Portree, responding to a request to tell the readers of the books which most moved and impressed them in the last 12 months. "...one of the delights of this book is the inclusion of magnified details from the published prints - intricate pictures within pictures revealing a whole new layer of pictorial information often previously unnoticed." Click here for Country Life review. "More than half the sketches in the book are being reproduced for the first time." 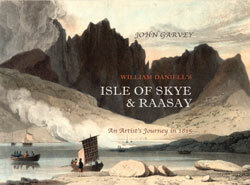 "William Daniell's Isle of Skye and Raasay" is an unexpected joy. It is simply an absorbing, original and beautiful book. To read the full review, reproduced here by courtesy of the West Highland Free Press, click here for West Highland Free Press review.